Manti is an authentic Turkish dish dating back all the way to Central Asia, where Turks once roamed as herdsman and nomads in the vast steppes that today lies in Siberia, Western China, Kazakhstan and Krygizistan. From the tenth century on they moved westward to Middle East, Anatolia and Europe, bringing the nomadic kitchen culture with them, which mainly consisted of meat dishes including mutton, and dairy products like cheeses and yogurt . Manti is a dish similar to ravioli ; dumplings packed with ground meat with onions and smothered with garlic yogurt. It is not an everyday dish and prepared mostly for family reunions. On such occasions the women in the family get together and stretch the dough from scratch and fill the carefully cut tiny pieces of dough with ground meat. Often children in the family help their grandmothers, mothers and aunts with this labor intensive task. 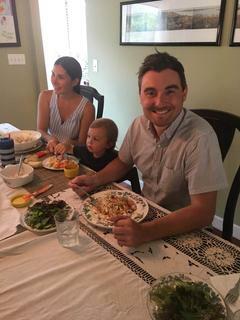 The finished product is then boiled like pasta and served hot topped with yogurt .This year on father’s day we prepared manti for a family of nine and it took three of us almost 2.5 hours to prepare the dish. 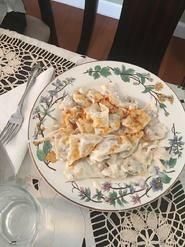 Here is the recipe for this delicious Turkish dish called Manti. If you are a talented baker go ahead and do the paper thin dough from scratch, but if you are like me, buy the Joseph’s Flax Oat Bran&Whole Wheat Lavash Bread from specialty stores or Walmart. Cover oven grates with aluminum foil and lay the dough sheets four per grate Mix cayenne pepper, black pepper and extra virgin olive oil in a cup and spread lightly over the dough sheets using a brush. Spread finely chopped feta cheese crumbs evenly on the sheets. Do not buy the commercial feta cheese crumbs, use Bulgarian or Turkish feta from a Mediterranean specialty store and DICE it. Get fresh parsley flakes and chop it in tiny pieces and spread on top of the feta crumbs. Put one grate at a time into the pre heated oven (350 F). Cook around 4-5 minutes to a golden brown and slightly crisp texture. Roll it to a wrap and enjoy it for breakfast. Note: The drüm has a crepe type of texture, hence if you have a sweet tooth, use butter, honey, jam, blue berry syrup or your imagination to dip the dürüm into, or better yet, spread these over and use fork and knife. Yummy. 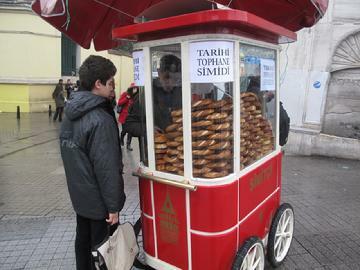 Simit is the favorite Turkish street vendor food. It �s a bagel type, doughnut looking big ring of rich bread texture, crispy and golden brown on the outside, moist on the inside. The price is right, around 50 cents. People eat it everywhere and all the time; for breakfast, on the run for lunch and in the afternoon with tea, before dinner stuck in the traffic. There is nothing like the fresh simit smell right out of the bakery and there is no other food for the urks living overseas which they crave more. -Don�t steal from the recipe, use the best products. -Don�t be lazy and double up recipe, do two separate batches and cook twice if necessary. -Share recipe and simit with friends. Istanbullite�s Food Section consists of some dinner ideas with pictures and recipe tips of what we cook at home. It is a combination of Mediterranean, Turkish and American cooking. The section however does not contain complete recipes. There are all kinds of recipes on the Internet but the best recipe is one�s own imagination and personal taste. MODERATION: No Thanks giving expressions like �I will bust, I am so full�, instead leave the table with still room in your stomach. PORTION CONTROL: It is related to the above. Control your red meat consumption. ( Ex.Twice a week 6 oz max). Same with sugar and deserts. Better to eat several times than a huge meal. Eat slow, enjoy your meal and talk. OLIVE OIL. We cook almost everything with olive oil. Use it in salads and for cooking. Our salad dressing is made of olive oil, vinegar, lemon juice, salt and pepper. Don�t invite me to dinner if your salad dressing is from the bottle. FRESH VEGETABLES: All kinds of Greens like Spinach and Colors like red cabbage. Some times steamed and sometimes cooked with little olive oil. SALADS: Don�t chop the ingredients to small and don�t peel all of the skin. Istanbullite�s Peasant Salad (Like a Italian Salad) has big slices of tomatoes, cucumbers and onion rings etc.. Not only you get the taste the salad better, but if you do not like one of the ingredients, you can pick it out. YOGURT AND FETA CHEESE: Feta cheese at Breakfast and Yogurt at dinner is so good. Bulgarian Feta from specialty stores and plain yogurt with no added sugar are yumm!. BREAD: Unfortunately can not do without fresh Bakery bread like French or Italian but have to limit it to two or three pieces a day. BREAKFAST: Istanbullite�s breakfast is a � Continental� but a rich one . Several jams (like sour cherry, apricot, figs), feta cheese, black olives, tomatoes , fruit of the season, cereal, milk , orange juice, and hot tea are some of the choices . We don�t eat bacon but similar products like sucuk(hot meat sausage), pastirma( dried meat) etc. only on Sunday�s. SPIRITS ; One or two glasses of red wine every night, and few shots of Raki once a week. The above list is not a complete one and Istanbullite does not claim that it is a scientific one. It is a list of habits which works for us. �Meze�s are Turkish appetizers, what the Greeks call Mezetta or Spaniards call Tapas. They are usually served before the main dish and are accompanied by few glasses of Raki the liquorish tasting favorite Turkish spirit or if you prefer a glass of wine. The Raki table is an adventure in fine dining which usually starts with cold mezes followed by hot mezes. Eating slow while enjoying friends conversation is the key. The main dish is usually fresh ocean caught fish with a green salad or a meat dish like lamb chops or shish kebab served on a bed of rice pilaf. The long lasting dinner traditionally ends with fresh fruits of the season and cup of Turkish Coffee. 1) Rakı sofrasında senden yaş�a b�y�k ehlikeyfe saygıyı kusur etmemek i�in kadehini onun kadehinin altına tokuşturacaksın. 1) At the raki table to show respect for the older raki drinker, click your glass at the base of his(her) glass. 2) Yaş�a senden b�y�k kişi kadehini kaldırmadan rakı kadehi sofradan kalkmaz. 2)You don�t start the toast before the older person at the table lifts his glass from the table. 3) Kadehe �nce rakı, sonra su, sonra buz konur. Sıra bozulursa anason kadehin �st�ne �ıkar, rakının tadı ka�ar. will float on top of the glass and raki�s taste will be ruined. 4) Yeni seri'yi kadehe �evire �evire d�kmeli ki o ilk hasat anasonun kokusu etrafa yayılsın. 4) When pouring raki from a new bottle , raki should be poured into the glass by constantly turning the bottle so the aroma lingers in the air. 5) Her rakı i�ilmez, her muhabbet �ekilmez, her sofrada demlenilmez. 5)Every raki is not drinkable, every table and every conversation is not suitable for drinking raki. TURKISH TEA IS PREPARED USING THE DOUBLE BOILER SYSTEM. THE LARGE TEA POT ON BOTTOM AND ON DIRECT FIRE AND A SECOND TEA POT ON TOP OF THE LARGE TEA POT ON THE BOILING WATER. THE TEA POTS IS CALLED ��AYDANLIK�. BOIL THE WATER ON MEDIUM HEAT IN THE LARGE TEA POT. PUT 1 TABLE SPOON OF LOOSE TEA LEAVES (3-4 TEA BAGS) INTO THE UPPER TEA POT AND FILL IT 3/4 WITH BOILED WATER. FILL THE LOWER POT WITH COLD WATER AGAIN AND PLACE THE TWO POTS ON TOP OF EACH OTHER. CLOSE THE TOP. GIVE IT A GOOD 15-20 MINUTES ON LOW-MEDIUM HEAT UNTIL WATER IN THE BOTTOM POT STARTS BOILING AGAIN.THIS TYPE OF SLOW COOKING WITH A DOUBLE �AYDANLIK IS CALLED �DEMLENMEK� . THE MORE �DEM� TIME, THE BETTER THE TEA. SERVING: POUR TEA FROM THE TEA POT INTO THE SMALL �AY GLASSES FILLING THEM HALF FULL WITH TEA. USE A STRAINER SO THAT LOOSE LEAVES DO NOT GO INTO THE GLASS. FILL THE REST OF THE GLASS WITH HOT WATER. PUT ONE OR TWO PIECES OF CUBE SUGAR AND STIR. TAKE A SMALL SIP, BE CAREFUL �AY WILL BE HOT. �K�rt k�ftesi� is tough to translate!. K�fte is Turkish style meatballs hot and spicy. But this k�fte is a vegeterian one, �Bulgur� instead of meat. And what is Bulgur? It is a form of wheat processed by parboiling, cracking and drying. How about �Bulgur-Pilav versus Rice-Pilav�, a healthier choice of course! That recipe will come some time later. K�rt K�fte is a popular ethnic dish in the Adana region of Turkey. Istanbullite always welcomes fellow �Istanbulites�� cooking suggestions. This one is from our �candost(true friend)� fellow Istanbulite Semiray. Semiray lived in Adana as a child and still has relatives there. I bet she learned the recipe from her mother �Atike Ana �. Most olive oil based dishes are vegetable dishes like green beans, navy beans, eggplant, leaks, stuffed peppers etc. All of these dishes are vegetarian dishes made without meat and served chilled (40F/4C or less). On the other hand solid fat based dishes are made using the same base ingredients with the addition of saturated fats (no trans fats) and beef and lamb.These dıshes are served hot: at least 165F(65C) and reheated to this temp when serving if they are kept refrigerated before. CAUTION NEVER LEAVE FOOD UN ATTENDED FOR MORE THAN 2 HOURS BETWEEN 40F(4C) AND 140 F( 54C) IN THE DANGER ZONE!!!! Every full course Turkish meal includes an olive oil based dish or zeytinyağlı. The �zeytin yağlı�s ( (Olive Oil Based ) are considered the best natural herbal laxatives. The �zeytinyaglı� in the picture is Lima beans and carrots, a Sitare �zmeral specialty. The other dish, the b�rek is also baked using olive oil with feta cheese and fresh parsley stuffed in layers of filo dough. (courtesy of �lker Durupınar). Ramadan is the holly month during which Muslims fast from dawn to sunset . You can eat a light midnight dinner called “sahur”, but all eating , drinking including water and other pleasurable activities stop with “the white threat of dawn appear to you, distinct from it’s black threat”* The days of Ramadan moves forward every year hence it is a lot more difficult to fast during summer, where the day light shines as long fifteen hours. The time of the day to start the fast is called “imsak” and the dinner is called “iftar”. Believe me, no other food tastes and is appreciated better than the “iftar”. In the past when there were no mass communication devices like radio,T.V etc. the “iftar” was announced by the firing of the cannon ball which is followed by the prayer of the imam from the minaret of the mosque. One breaks the fast traditionally with something simple like a piece of date or olive or better yet with a sip of water. Then comes the little delicate sees or appetizers followed by main dishes and deserts. The Yaprak Dolmasi featured here is such a main dish. -In a mixing bowl mix the flour with the dough ingredients. The dough has to be not sticky, otherwise it will not stretch. Let the dough rest covered for 20 minutes. While the dough is rising mix the ground meat with the filling ingredients in a separate bowl. -Divide the dough ball in 3 equal pieces. 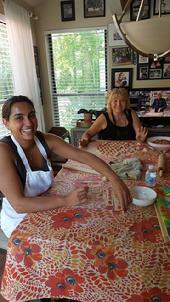 Stretch the dough with a rolling pin on a flat surface to a circle , approximately 16-18 inches in diameter. Stretch all three dough balls and don’t forget to spread flour on the flat surface to prevent sticking. 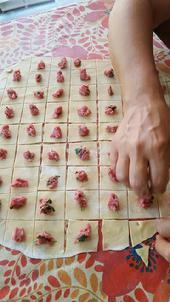 - Fill the dough squares with the ground meat mix and fold over into triangles. -Boil 8 cups of water in a pot, adding 2 teaspoons of salt. When the water boils add the manti dumplings into the water and boil for approximately 10 minutes. -While manti is cooking mix the plain yogurt (which people here in the U.S. call “Greek yogurt”, but is actually Turkish all the way from Central Asia !) with the diced garlic in a bowl. Then, ina frying pan melt the butter with pepper paste and crushed red pepper flakes. -When there is no more foam left on top of the boiling dumplings manti is ready. Drain it in a colander and put it into large rectangular corningware dish. Put first the yogurt mix and then the sizzling butter with pepper sauce on top .Start serving manti into the plates. Extra crushed pepper, sumac and mint can be added by choice. Yummm ! You will go for seconds. The “dürüm” or the roll is a regional Turkish wrap or crepe type dough usually filled with feta cheese, ground meat or lamb. While “lahmacun” is a South Eastern Turkish delicacie hot and spicy, this one is usually on a thinner dough, lighter in taste and eaten for breakfast or lunch. From Izmir to Antalya one can taste this wrap in every little village made usually by women on a round wooden dough board using a thin stick like rolling pin called “oklava”. While lahmacun is called the Turkish Pizza , the dürüm is usually referred as the “Turkish Pancake”. 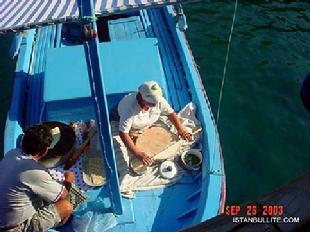 The picture above is from a husband and wife in a little boat preparing dürüms to the luxury yacht on a “Blue Voyage” in the Mediterranean. The woman rolled the dough in front of our very eyes right there on the boat, while the husband cooked the bread on the small grill and topped with butter and blueberry syrup and feta cheese and served to our yacht early in the morning . What a service! A SHORT CUT FOR LAHMAJUN LOVERS IN THE U.S.
* Our preference is Mission Brand 100 percent Whole wheat , 0g trans fat med soft Tacos. also for a vegetarian option use chopped Annaheim peppers and portobella mushrooms instead of the meat. Fine-chop onions and garlic, mix with ground beef add crushed red peppers, salt and and re- mix with a spatula in a bowl. Put 2 tablespoons of oil into the pan and sauté to a medium done ness stirring constantly. Do not overcook! Drain the meat in a colander and spread on a board. Fine-chop the meat with a butchers knife and put back in the mixing bowl add the tomato sauce and salsa and mix with a spatula. Evenly portion 2 table spoons of the meat in to the middle of the tortillas. ( 6 Tortillas are laid down on the oven grate covered with aluminum foil). Spread the meat evenly on the tortillas. Top with chopped parsley. Cook the mex-majuns one tray at a time in a pre heated oven for three minutes at 450F. Make sure there is enough cilantro type greens on the table . Serve with ”cacik” the cold yogurt soup with chopped cucumbers and “piyaz” ,the bean and onion salad with tomatoes. Drink suggestions home made fresh lemonade and iced tea. Garnish Mexmajun with greens. ROOOOOOOOL IT AND EAT IT. Activate yeast in half cup of 110 F water( Note too hot water will kill yeast). Mix all ingredients in a mixing bowl, add yeast. Make a french bread loaf. Spray top and cover with a humid towel. Let the loaf double in size in room temp. (30-45 min) . Mark and cut the loaf to 10 equal portions. Form dough balls. Form a snake from the dough ball . Bend the snake to two from the middle. Twist the two sides on top of each other singing �twist again�. Form a o ring connecting two ends with a pitch of water. Dip the rings into the pekmez bath. (50/50 syrup and water). Put the wet rings into the sesame sand box covering both sides with seeds. Put the rings on an oven grate (covered with aluminum foil and sprayed with vegie oil) . Let the simits proof again on the grate for an additional 20-25 minutes. (Do not over proof). Preheat the oven to 500 F. Cook one tray at a time for 15 minutes. Let it cool down and serve with �ay. *Among several recipes on the iınternet İstanbullite modified and tried the one under the title �Arif olan anlar�. Adana is a southern city in Turkey. Food is as hot as Cajun Food of New Orleans. Meat on the skewer is ground round 90/10. Add salt, red pepper flakes, black pepper. Chicken breast strips marinated in olive oil with paprika and salt. Peppers hot, corn sweet but burned Turkish style. White rice basmani , water/ rice ratio 1.5/1.Choban salad garnish w. imagination. Suggested spirits: Efes Beer, Fruit juices and lots of Water. Istanbullites love to eat breakfast outdoors where the teapot never runs out of water.Note the champagne in the picture is for a special celebration and not part of the routine. Once you are tea-ed out, go for a cup of Turkish coffee. The cold appetizer pictured here is pinto beans cooked in olive oil. You can pick a bushel from the local farmers market and go through the long process of shelling. Saute fine chopped onions and sliced carrots in olive oil, add diced tomatoes, add water, bring to a boil Cook on high heat for fifteen minutes cover and cook until the beans are done. Chill it in the frig garnish with fresh parsley and serve with slices of lemon on the side. Nobody ,but nobody cooked the BARBUNYA better than my mother LAMIA. The beans were always A LA DENTE, melted in your mouth not in the pan. The hot appetizer in the picture is fried eggplants topped with my dear wife SITARE'S special tomato sauce. Fry the sliced eggplants in the pan in olive oil (NO breading please !!). For a healthier option spread eggplant slices with olive oil on a tin foil and GRILLL it. Sitare's secret sauce is a salsa with tomato chunks, fresh diced garlic, salt and black pepper to taste. If tomatoes don't agree with you, consider a thick yogurt sauce with fresh garlic and dill as an alternative. On the left is how I described the making of Turkish Coffee to a friend years ago. The Turkish coffee is a strong coffee and a good stomach-settler after a reach meal. You have the choice of sugar and its quantity. Drink it with small sips like you are tasting a good glass of wine. Once you done, turn the cup on the saucer and look for somebody who can tell your fortune. Istanbullite loves seasonal fresh fish from Bosporus but often has to settle with Orange Roughy. (Atlantik Levregi ?, resembles Mercan). Season it with pepper& salt seasoning and virgin olive oil. Top with hot green pepper(�arliston). GRILLLLLLLLLLL it. Serve on a bed of bay leaves, garnish with fresh "LIMONES". Spaghetti medley: In a frying pan saut� thin slices of zucchini in three tbs. of V.olive oil for 5 min. Add cherry tomatoes and fresh spinach for an additional 2 min. Drain mix in colander, mix with the boiled spaghetti noodles. DO NOT add additional oil (CHOLESTEROL WATCH). Istanbullites drink tea for breakfast, before dinner, after dinner and all day long. The tea pot never runs out of water,the tea glass never run out �ay. Adults drink tea, even toddlers drink tea from the saucer. Few rules: If the salesman at the Bazaar or your host offers you tea , never refuse it. It is not polite to refuse tea. Cube sugar is better, some people put it under their tongue and sip the plain tea. When you stir the sugar, make sure the spoon touches the glass with a rhythm. Keep the melody going for at least 10 seconds. Slurping is allowed in some circumstances. Keep the refills coming; minimum three or four no maximum limit. �AYLAR BENDEN-TEA IS ON ME! Pick a bag of Bulgur from specialty section of your grocery store.Wash and drain bulgur in a strainer. Wait till it proofs and doubles in size. Mix with flour (ratio:one flour to two bulgur). Squeeze the mix inside your wrist forming marble size balls. Boil the balls like pasta in hot water.Drain the water. (Keeping little amount of water is optional). Prep plain yogurt by mixing with fresh gloves of garlic.Pour the yogurt on top of the dish. Saute fresh tomatoes, hot pepper paste and red pepper flakes with olive oil in a frying pan..
Pour the sauce generously on top of the yogurt. Garnish with fresh mints and serve. This Sunday our main dish is baked salmon. Whole but pre-cut, wild caught salmon with silver skin. Marinate with virgın olive oil, season with salt and pepper, top with diced fresh tomatoes and basil mix add sliced lemons. Istanbullite likes to taste the fish, not the prepped commercial sauce.Bake salmon to 165F(66C) in the oven. Do not over cook! 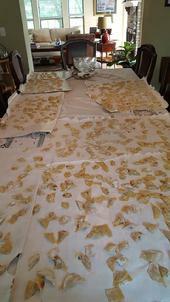 ( Add fresh bay leaves durıng cooking for taste, if they are dry add for looks when serving). 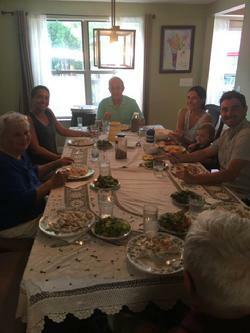 Side dishes �B�rek� filled with feta, choice of wheat and white basmati rice as pictured, olive oil based lima beans with carrots, � kıvırcık� green salad with lemon juice, baked home fries with onion rings. Spirits: fresh squezed lemonade, �kadeh� of lions milk or glass of Chablis. As the cajuns say: LE BONS TEMPS ROULE! One of Istanbullite�s favorite dishes is the stuffed grape leaves. The one pictured here is not the olive oiled cold �meze� which the Greeks call �dolmati� or what we call �zeytinyagli yaprak sarmasi�. We will wait for that one until the Ramadan is over . The one featured here is an excellent dish for the �iftar� *dinner. Sade yağlı yaprak dolması, the stuffed grape leaves, cooked in butter and served hot. And nobody cooks it better than �lker Durupınar, my mother-in law. I asked her what here secret was. She says the secret is the meat : half of it has to be ground round 90/20, but the other half has to have some fat, maybe 80/20 ? Mix the meat with rice and roll it into the grape leaves like my grandfather used roll his cigarettes and closing it on both ends. Cover the bottom of the pan with tomato sauce, add salt, parsley, dill weed and mint, add water,cover and cook on medium heat. Make sure sure to add water during cooking if necessary. Serve by pouring the au- jus from the pot, on top of the dolmas and plain yogurt on side. AFIYET OLSUN , and if you are breaking your fast MAY GOD ACCEPT IT. *See info about Ramadan on the left.